R My Name is Rachel by Patricia Feilly Giff. Review: Ever wonder what it is like to live in the time of the Depression? Take an adventure with Rachel and learn all about the bitter life concealed in this time of sadness. 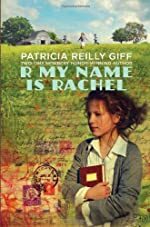 R My Name is Rachel, By: Patricia Reilly Giff is a stunning book. It is an exquisitely written novel which I was very much pleased to have read. I loved R My Name is Rachel for the story keeps readers hooked while they continued wondering how three kids in the middle of nowhere are going to survive alone. This book informs readers of the hardships others had to face during the Depression while using a playful plot to keep the readers' focus. I recommend this book for readers over 8 years old who enjoy historical fiction. The content is appropriate for children and a very fun yet educational read. Once again Giff has created another genius novel worthy of an award. Like her previous work it is an exceptional read! You will eagerly want to flip pages until you get to the end where the journey ends but as Rachel would say "Keep looking forward." Review written by Adele (6th grade student). We would like to thank Random House for providing a copy of R My Name is Rachel for this review. Have you read R My Name is Rachel? How would you rate it?